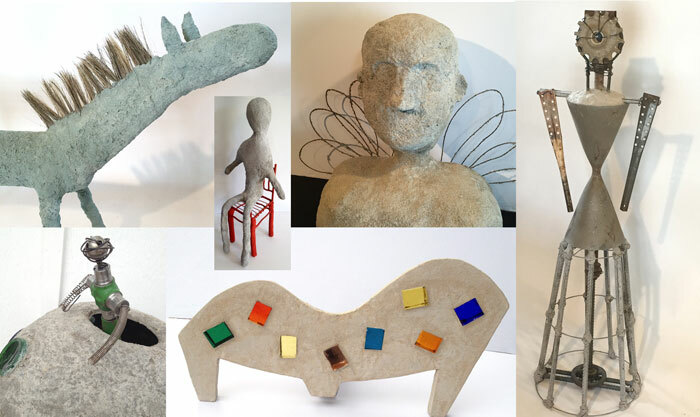 I have been quite busy this summer creating some fun and fantastic new sculptures. One of my favorites is title “All Dressed Up” which incorporates a large found metal object that I’ve had for over ten years. This is one of the new sculptures that I am getting ready to show at a Sculpture show in North Carolina. But I think my all time favorite up to this time is a new Horse sculpture named “Blue”. He was made using a metal armature that I fashioned from hardware cloth, wire, chicken wire, paint, sand and cement. This past month, however, was filled with lots of time with three groups of grandkids who came to visit back-to-back. We did lots of craft projects, went swimming, went rock collecting and more. The last grandson who came to visit even made his very first cement sculpture … one of the Southpark characters, Eric. So, it’s been a fun and busy few months. Now I am getting some of the business stuff done for the upcoming show, making new handouts, etc. Stay tuned and I’ll let you know how it went!